At medical and scientific conferences, the majority of attendees tend to be physicians who already use iOS devices and could soon be receiving an Apple Watch from their hospital. With the focus on health-related functionality, the Apple Watch is generating buzz in the healthcare industry: an app for doctors to talk to each other easily, a hospital running a pilot giving Apple Watches to patients, or new healthcare apps being released. In this industry, you may see attendees arriving with an Apple Watch on their wrist sooner than in other fields. 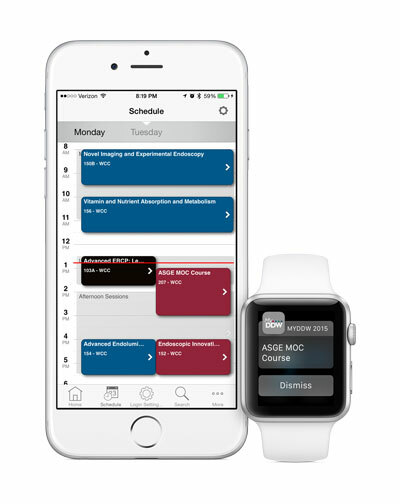 As the meeting planner, what do you need to do to make your conference app work with an Apple Watch? At this point: nothing – sit back, and relax. The main reasons attendees use your conference app is to build their personal schedule, bookmark abstracts, and maybe even take notes. The core feature of reminding attendees of their next session is fully supported out of the box via notifications. This also means that any of your push notifications will appear on the Apple Watch too – without having to do anything special. Learn more about notifications on the Apple Watch. Apple Watch users who have the conference app installed will automatically receive their upcoming session notification directly on their watch 15 minutes before session start. The notification contains the app icon and the session title. Any alert messages or pre-scheduled notifications you send via the EventPilot CMS will be displayed directly on the Apple Watch if the phone is not in use. GPS based notifications or iBeacon based proximity alerts will also appear on the watch. You can send targeted messages and reminders that are being accessed and seen unlike ever before. With the power of sending notifications to your attendees’ wrist comes great responsibility. Focus your messages on relevant and critical notifications, so your attendees will know that their watch is telling them something timely and valuable, and not just another ad. Instead of a welcome notification at the expo entrance, how could you make the sponsor message more relevant? Depending on the adoption rate and interest for additional functionality, there are many speculations of what the Apple Watch could bring to events ranging from registration to lead scanning. When looking at new technologies, it’s key to stay focused on the main goal of creating a great attendee experience and not an additional distraction or limiting functionality to a small user base. Maybe you could start gauging interest by using the additional features that are already available via the Apple Watch itself. For example, with the built-in Near Field Communication and integrated Apple Pay Service, your attendees could complete purchases at the reg desk and show their ticket via the Passbook App on their watch. Attendees could even tweet directly from the Apple Watch without pulling out their phone. [at] ativsoftware.com and let us know what Apple Watch features you’d like to see in future EventPilot Conference Apps.